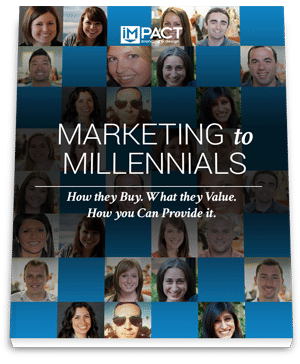 Free Ebook:Marketing to Millennials How they Buy. What they Value. How you Can Provide It. Millennials now represent the largest demographic in the United States. And their buying behavior is much different than anything you're used to. Is your marketing strategy adapting with your audience? Learn from industry professionals the most effective ways for engaging with Millennials as well as what affects their purchasing decisions. Insight from Millennial marketers on the elements that affect their buying decisions. How to adapt your strategy to the changes in consumer behavior. This ebook also contains quotes from Millennial professionals from around the marketing industry!